This is “Web Exercises”, section 5.5 from the book Beginning Project Management (v. 1.1). For details on it (including licensing), click here. Describe the characteristics of the Myers-Briggs personality profile. Describe the characteristics of emotional intelligence. Locate, download, and analyze meeting agenda examples. A popular tool for categorizing personality types is the Myers-Briggs Type Indicator (MBTI). In this exercise, you learn about the MBTI and other tests based on the personality types described by psychologist Carl Jung. Start a web browser and go to the Myers and Briggs Foundation website by typing http://www.myersbriggs.org/my-mbti-personality-type/mbti-basics. Read the section titled MBTI Basics. Scroll down to the table of sixteen personality types. Move the mouse pointer over one of the types to display the pop-up window that shows the explanation of that type. Point to one of the other types in the table and then capture the screen. Open a Word document. In the first line, type your name. Below your name, paste the screen capture. Save that document as Ch05MBStudentName.doc using the Word 2003 .doc file format. Switch back to the web page. Below the table, click All types are equal to move to that web page. Read the page. Capture a portion of the All types are equal page and paste it into the Word document. The Myers-Briggs test is administered and interpreted by trained and certified people who help explain the meaning of the results. This is an important function because terms like introvert do not mean what many people normally assume them to mean, and self-evaluation can be misinterpreted. It can still be instructive to take one of the free, online tests that are similar to the MBTI. In a web browser, type http://www.humanmetrics.com/cgi-win/jtypes1.htm. Follow the directions to take the Jung Typology Test (it consists of seventy-two Yes/No questions). Display the test score, as shown in Figure 5.13 "Example of a Result", except it may be any of the sixteen types. Notice the brief explanation in bulleted list format. Capture this screen and paste it into the word processing document. Return to the Myers and Briggs Foundation website by typing http://www.myersbriggs.org/my-mbti-personality-type/mbti-basics. Scroll down to the table of types and click the one that corresponds to your score from the other website. Capture the screen and paste it into the word processing document. 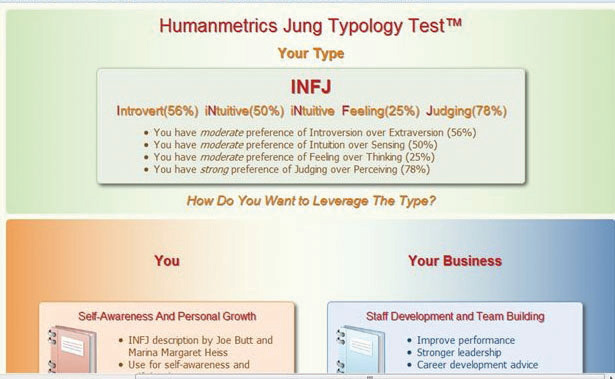 Below the screens, reflect on what you learned about the MBTI and the Jung personality types. Relate any experiences you might have had with this personality typing and your impressions of its accuracy in describing your personality. Emotional Intelligence: Developing a Strong MindBased on a graduate project by Bonnie Jankovic, December 2011. In the project management profession, developing strong people skills helps management understand how to deal with personality types, like the Myers-Briggs test uses the emotional intelligence test site to develop strong career building skills. Mind Tools helps develop strong people skills. 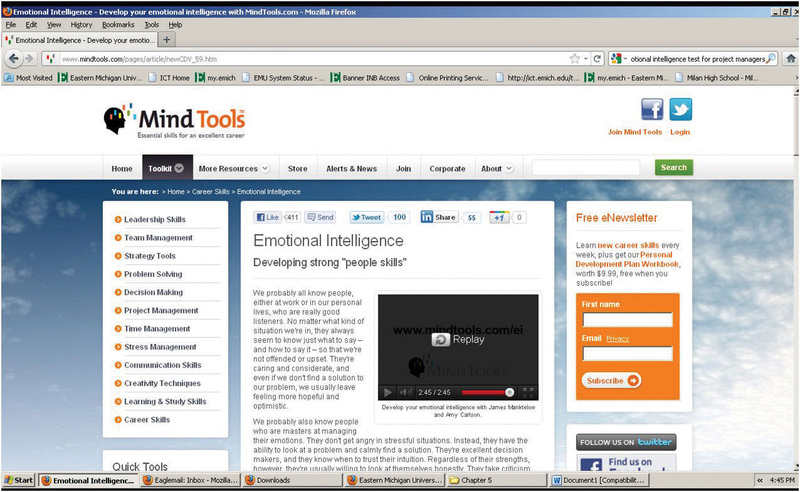 Start a web browser and go to the Mind Tools website at http://www.mindtools.com/pages/article/newCDV_59.htm. Open MS Word and save a new document as Ch5EQStudentName.doc. Click the Play button on the video. Capture a screen that shows the video playing and then paste it into your Word document. In a browser, type http://www.ihhp.com/testsite.htm. Source: Courtesy of The Institute for Health and Human Potential. Begin the test and fill out the first few questions. Copy the screen and then paste it into your Word document. Complete the test and then click the Evaluate button. 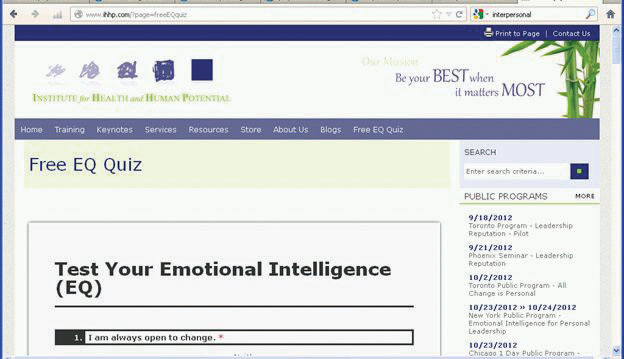 In the Word document below the screen captures, reflect on what you learned about emotional intelligence (EQ) and then describe how being more aware of EQ might improve the work environment on a project. Save the document, and then submit it as directed by your instructor. Different types of meetings have different objectives. To achieve those objectives, it helps to organize the agenda of the meeting around those objectives and to sequence them properly. Studying examples used by other organizations will assist in choosing an agenda that suits the purpose of a meeting. Open a blank word processing document and type your name and date on the first line. Save the file as Ch05MeetingsStudentName using the Word 2003 file format that ends with .doc. 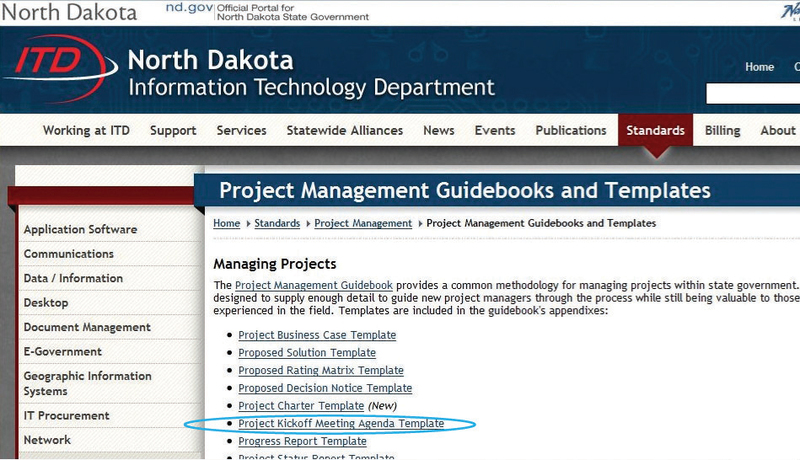 Start a web browser program and go to the Project Management Guidebooks and Templates page for the State of North Dakota at http://www.nd.gov/itd/standards/project-management/project-management-guidebooks-and-templates. A list of links displays, as shown in Figure 5.16 "North Dakota Projects"
Source: Courtesy of the North Dakota Information Technology Department. Add this website to your browser’s favorites list, in a folder named Projects. Capture a screen that shows a link to this site in the Projects folder of your bookmarks or favorites, and then paste it into the word processing document. On the web page, under Managing Projects, click Project Kickoff Meeting Agenda Template (25kb rtf). Notice the file is labeled “25kb rtf,” which means that it is a small file saved in rich text format (rtf). The rtf format is a standard format that virtually all word processing programs can read. Save the file to your computer and then open it. Review the topics and the time allowed for each topic. Near the top of the page, select the placeholder text to the right of Project, and then type Classwork for StudentName, where you use your name. Capture a screen that shows your modification to the agenda and paste it into the word processing document. What type of meeting is this (action item, management, or leadership)? Support your analysis with references to the sample agenda and quotations from the text. Is this agenda designed to build trust? Compare this agenda to the section in the text titled Creating Trust. At the bottom of the word processing document, write an essay of between two hundred and five hundred words that consists of two parts that address these two questions. Save Ch05MeetingsStudentName and submit it as directed by the instructor. Close all documents and programs.